The Legend widget displays labels and symbols for layers in the map. It supports dynamic, tiled, image, feature, and KML layer types as well as WMS layers with an associated legend URL. 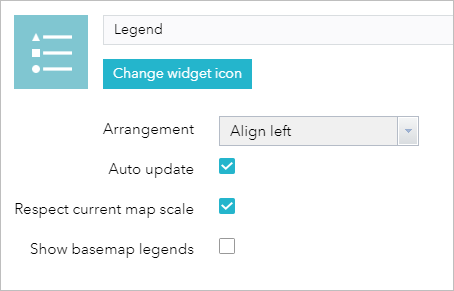 The Legend widget can be set to automatically update when the visibility of a layer or sublayer changes. When no operational layers are rendered in the map, the Legend widget is blank. The order in which layers appear in the Legend widget corresponds to the layer order in the map. The widget can also be set to respect the scale dependencies of the layers in the map. 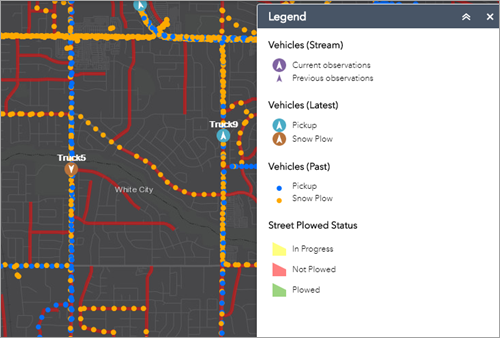 This can be a useful indicator to map readers that additional data layers are present in the map but currently not displayed in the map because of scale dependencies. This opens the configuration window for this widget. Optionally click Change widget icon if you want to replace the default icon for this widget. A file explorer window opens, allowing you to browse to a local image file to use as the widget icon. Select an arrangement. There are two options, LEFT and RIGHT (LEFT is the default arrangement). Check or uncheck the Auto Update check box. When this option is checked, the Legend widget automatically updates if the visibility of a layer or sublayer changes. Check or uncheck the Respect Current Map Scale check box. When this option is checked, the Legend widget only shows symbols and labels for layers visible at the current map scale. Optionally check Show basemap legends. This option allows you to display the labels and symbols for layers in the basemap. When the application starts, the Legend widget is automatically enabled. Clicking the Legend widget displays the Legend window. Clicking the x in the upper right corner of the Legend window closes it.